Summing up one of the stock market's best retailers in just a few images. Costco (NASDAQ:COST) is one of the market's best-performing national retailers. 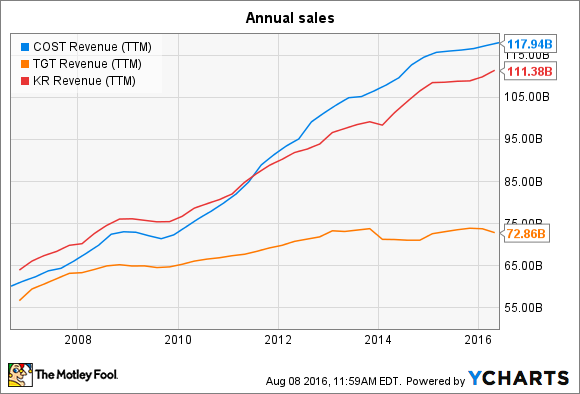 The warehouse giant's stock returns have trounced the market over the last decade, and left rivals like Wal-Mart (NYSE:WMT), Kroger (NYSE:KR), and Target (NYSE:TGT) far behind. Below, I'll look beneath the headline numbers to show in a few charts why Costco has been such a strong investment lately. Costco became the second-biggest retailer in the United States in 2014, behind Wal-Mart, as it crossed $100 billion in annual sales. It had roughly kept pace with comparable rivals, including Kroger and Target, until about five years ago, when Costco's streak of market-thumping customer traffic growth began. The wholesaler has now enjoyed better than 4% traffic gains every year since 2010, translating into at least 6% comparable-store-sales growth in each of the last five years. In comparison, Kroger's comps were 5% in 2015 and 2014, and Target's were 2% and 1%, respectively. Meanwhile, Wal-Mart has barely managed any comps gains since 2014. 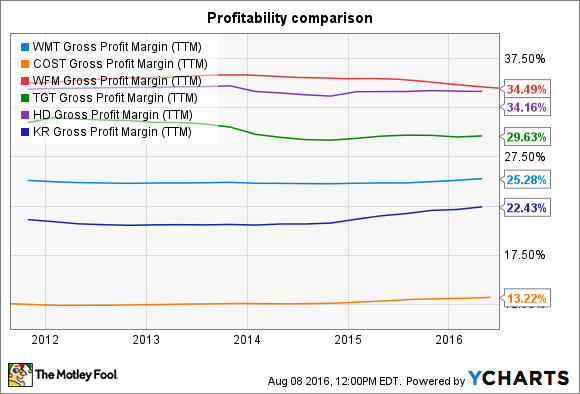 WMT Gross Profit Margin (TTM) data by YCharts. Costco earns close to nothing on the sales it makes to members. In fact, its gross profit margin is barely half those of Whole Foods (NASDAQ: WFM) and Home Depot (NYSE: HD), and well below those of Kroger, Target, and Wal-Mart. This is a key feature of Costco's business model, though. The company uses a bare-bones approach to retailing -- for example, by carrying dramatically fewer products than rivals so that inventory moves much faster through the system. "This turnover," executives explain in the 10-K report, "when combined with the operating efficiencies achieved by volume purchasing, efficient distribution and reduced handling of merchandise in no-frills, self-service warehouse facilities, enables us to operate profitably at significantly lower gross margins than traditional wholesalers, mass merchandisers, supermarkets, and supercenters." Because it generates most of its profits from membership fees rather than sales markups, Costco's earnings are much steadier than rivals'. Costco net income by fiscal year. Source: Costco financial filings. Net income has marched up from $1.5 billion in 2011 to $2.4 billion last year. Over the last decade, Costco's profit has roughly doubled, compared to a 30% boost for both Wal-Mart and Target. Kroger's overall gains are comparable, but shareholders have had to endure wild swings along the way. This predictable earnings growth helps explain why Costco isn't valued like its strict-retailing peers. Investors are paying 31 times next year's profit to buy the wholesaler, compared to Wal-Mart's 17 P/E and the 15 P/E they've assigned to Target and Kroger. Costco average warehouse sales by opening year. Source: Costco annual report. Costco's warehouses are incredibly efficient, with over $160 million of sales per location, per year. That average number improves steadily as a store ages and establishes itself in the community. Last year, the retailer's newest stores, for example, averaged just $83 million of annual sales in their first year, while its oldest ones took in nearly $180 million annually. That growing return helps explain why Costco plans to spend $3 billion this year -- up 25% over 2015 -- to aggressively expand its store base. In addition to monitoring sales growth, investors can judge Costco's relevance with customers by keeping track of its membership renewal rate. The retailer practically dares people to cancel their membership by making it incredibly easy to back out of the annual fee. Renewal rate for U.S. members of Costco. Source: Costco financial filings. Costco's renewal rate is running at roughly 91% in the U.S. this year -- up 3 percentage points since 2010. This boost is the best evidence we have that the retailer is well-protected from the stampede into digital shopping that has hurt so many of its peers. The company needs that protection. Because Costco keeps a far smaller footprint than competitors, it can't simply retrofit locations to act as online distribution centers or order-pickup points. Looking ahead, key challenges include Costco's unproven appeal to a younger, less affluent shopping demographic -- in addition to that continued march to internet retailing. The warehouse giant has consistently demonstrated that it can solve problems like these, though, by simply doing what it does best: Focusing on its core value proposition of unbeatable price leadership.